On Sunday night we went to see About Time. When the film had finished, it took me an hour to stop crying. I eventually stopped and later my 19 year old daughter Lizzy, drifted into the kitchen and asked what the film was like. When I started telling her, I started crying again. She put her arms around me, like my Mum used to and I had the clearest memory of being a child again. The film is just so beautiful. Mark Kermode used the word Capraesque in his review and he’s right. He used it in its purest form and About Time delivers this to its fullest extent. It carries the humour and the truth and the agony of love, that only someone who has truly loved and truly been loved, could have made. With a weather eye to the spoiler horizon, I can detail only that the film deals with love. Romantic love forming one part and parental love the other. As with all good parental influence, that stoic foundation of tutor, mentor and guide underpins the piece, quietly at first and only when needed. Then it’s gently revealed through the life of the film's protagonist, Tim. This is a stellar performance by Domhnall Gleeson, deftly delivering that familiar duality of fragility and strength, which inhabits many of us as we jump into the deep end of adulthood. We are all a little afraid of yet desperate to, travel through the story of our lives. Tim at the age of 21 learns the secret of the men in his family, from his father, a heart breaking, understated yet perfectly detailed, performance from Bill Nighy. They have the capacity to return to certain times in their lives and revisit events and choices. Tim embarks on a journey of discovery with only one clear objective for the deployment of his superpower, getting a girlfriend. It’s unlikely that many 21 year olds, would have used it for anything else. As Tim’s life unfolds his growing maturity imbues him with better uses of his gift. He finds ‘the’ girl, makes a home and family of his own, and this is where the truth of parental love is raised so perfectly by Richard Curtis. He delivers, with a light yet embracing touch, the universal truth that it is only when we become parents ourselves that we fully appreciate the love we were nurtured by. If we’re lucky. As the parental hand that held our own lets go, so then can we hold our own child’s hand; to protect, to guide and to show that we are by their side. As with all Richard Curtis productions the women characters are three dimensional, truthful, funny and real. It is as ever, so delightful to see a film-maker paint the women featured from the palette of equality not misogyny. There are no women as sexual props, just women as real people. Mary, Mum-Mary and Tim’s sister, Kit Kat are characters who stay with you for their words and actions. Lindsay Duncan, Rachel McAdams and Lydia Wilson, give superb, considered and nuanced performances. Tom Hollander as the acidly angry writer Harry, is breathtaking as always as is the gently vague and irrepressibly optimistic, Uncle D played by Richard Cordery. Cameos from the mighty Richard E Grant and the superb and much missed Richard Griffiths, people a Richard Curtis film as ever, with the believable and delightful characters of all of our lives. In 2006 my Mum was in the middle stages of Alzheimer’s and had drifted gently away from me for the previous five years of her diagnosis. She was still managing to live independently with care provision, but this would not be for long. She was spending Christmas day with us and I’d settled the girls in bed relatively early, which was unusual for two children with Autism. I came downstairs and sat by Mum on the sofa expecting to see her usual sweetly vague smile when she suddenly took my hand and began to talk to me. Like she used to, like she hadn’t done for so long. In that conversation she told me how proud she was of me. 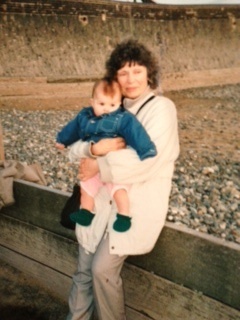 That I was a good mum, and how she knew that things were difficult, but to keep going exactly as I was doing. She talked about my brother who had died when he was 17 on another Christmas Day in 1978. I called for Phil, to come in to the sitting room and he chatted to her too. She stayed like this for about an hour and then slowly began to lose her thread and her words began to jumble and lose meaning and her sweet vague smile returned. Still gentle, but once again, back into the darkness of her condition which eventually took her from us completely in 2011. 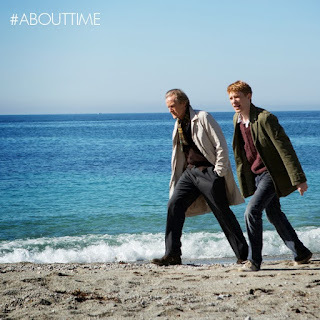 I’m not a film critic so I don’t have to try and find anything wrong with About Time, which is good because there isn't anything wrong with About Time. It's a lovely, funny, warm and embracing look at love and families and hope and truth. I can also say thank you to Richard Curtis and everyone involved, for a film which gives us all permission to remember and celebrate what really matters. All I know is that in the age we are moving through currently, there will many who might not want to revisit this historical period of their lives. But as ever we look to the artists to raise us from the depths of despair, of hardship and of pain, for a little respite. This film is in the finest traditions of escapism, through truth; of story telling without cynicism and of the embracing fact that love, wherever you find it, still matters more than anything else we will ever experience. Phil is just back from the chemist. It’s Saturday so as you can imagine it’s busy. Phil was waiting his turn when the lady in front of him handed an A4 size blister pack of medicines to the chemist and said that this weekend’s medication was missing. The chemist was confused and the lady was adamant. The queue began to lengthen. Behind Phil another man was becoming annoyed and with every question from the lady he sighed and tutted. The lady continued, by now she was becoming frustrated and annoyed. The lady looked at him and smiled a lovely smile. Gentle and calm. Another member of staff walked past them both and left. There is a Dr’s surgery close by and Phil watched as the staff member went directly there. The angry man gave up and marched out. His morning made infinitely worse no doubt by a “foolish old woman” keeping everyone waiting. Lady. The lady took her seat. Phil knew, the chemist knew and when Phil told me this story I knew. Alzheimer’s disease in the early stages causes much frustration to others unfamiliar with the condition. As we race through life assured of our own importance and correctness, we don’t always have time to remember that we are not all gifted in the same way. Yet we should. We still have that capacity to remember. Those with Alzheimer’s do not. Sadly accidental overdoses of medication are common. Short-term memory loss is the first part of the brain to be affected. When taking tablets daily is routine nothing distinguishes one dose from another, and when your concept of time is altered an hour passed, could be interchanged for a day. It was clear to anyone taking the time to notice, that this lady was one who needed compassion and empathy, not frustration and ignorance. The chemist took that time and realised how potentially serious the situation was. Irritated bystanders, making the lady feel worse in her confusion, because of a brief interruption to their day, only causes more confusion and fear. Because that is the thing about losing your memory, it’s terrifying. Phil knew because of my Mum. The sweet smile to hide the confusion was one which we knew well. She spent her life caring for others as a nurse, and in relaying this I’m attempting to continue to do that, in the way that she would have done. It’s a request for compassion for strangers and for kindness to a known or unknown vulnerability Irrespective of how irritated you may feel or how experienced you are, slowing down gives you time to consider. That’s what Mum taught me to do, directly and indirectly we need to do this more. I’m used to losing people I love. Whether it’s actual loss like the death of my brother at 17 or my mum at 77, or emotional loss like my mum’s slow development of Alzheimer’s or my learning disabled daughter going to residential school, I’m quite familiar with the concept. Being a carer for twenty years also familiarised me with the notion of being a loser. Because when your needs and wishes are superseded by actual needs and advocacy for 3 other people, you have to adjust to your position of failed hopes because otherwise you fail people whose lives depend on you. I’m 47 now so in the years that I stood back from ambition and desire and career and status, I was able to learn things about myself and about life that gave me clarity of viewpoint. In short I learnt what mattered. I learnt that empathy is a gift, which comes naturally to some and one which definitely should be valued much more than it is. I feel it’s so lacking in our dealings with one another that it really should be taught in schools. In recent weeks we’ve seen that the lack of empathy, which is so crucial to our humanity has entrenched itself on social networking sites. People write messages to one another, which are sometimes criminal like threats or are morally criminal, like bullying. Either the lonely individual venting at high profile people from their safe place of anonymity or more worryingly people with a platform deciding to organise and orchestrate attacks on those people they deem to have transgressed. It is those people who are the most worrying to me. Andy Warhol said that in the future all of us would be famous for fifteen minutes. I’ve tried in the fifteen minutes I’ve had, spread over five years of online campaigning, to make sure my time counted. I haven’t always succeeded and I haven’t always been polite but the horrors unfolding for many disabled people, whether hate crime in our streets or policy from our legislators has made me acutely aware that there are real lives at stake again. These lives have value to me. So I’ve used my time to tell these stories, I’ve used my time to shout up. What I’m seeing now is that these raised voices on social media, spreading out into actual media, are not shouting up but instead shouting at, their perceived targets. The crimes their targets stand accused of are not crimes of actual transgression but of perceived transgression. Myths begun by bullying mobs are spreading like the norovirus they truly are and like the norovirus they are composed of bile and excrement. Clones with the same values further this perversion of truth and frustrated ambition; the mobs are now dominating all online debate and conversation with a reign of terror, which ensures that too many people are being silenced or hounded into submission. Meanwhile racists, misogynists, homophobes, disablists and the religious right can stand back with a self-satisfied smile and watch as their work is being done for them. Because now those who would formerly have challenged such bigotry across social media, are removing themselves from these platforms, because the mobs are wrongly accusing them of the very things they fight against. The mobs so assured of their own correctness, are simply ensuring that the only voices being heard are theirs and they are venomously attacking the wrong people. In their dogged pursuit of this one objective they are failing everyone else. They want their voices to be heard but they fail to recognise the crucial flaw in their determination is that they are incapable of listening. Their message is one of denigrating others and as they vent their own agenda of personal ‘injustice’ they silence those who speak of actual injustice affecting millions of people. There has never been a more crucial time to dance in the light and to broaden the light to those who are standing in the shadows but those occupying the social media stage currently seem to have forgotten why they claim to be there. Women attacking other women, activists, attacking other activists and fracturing political agendas of selfhood, are demeaning the struggle so bravely fought for around the world. Our artists, writers, storytellers, journalists, campaigners and musicians have a wealth of real stories to tell. Yet the poverty of activism which now seems to dominate our media of “he said” “she said” of article and counter article, of sound bites and quotes and ‘who did what to whom’ is predicated on a “what about me” ideology and it’s slowly suffocating actual debate. We need to recognise and grieve for this loss, as it's a huge debasement of the forum of vital debate. Stand back, rethink and for the sake of us all, make your fifteen minutes count, make it mean something other than your own ego, or please hand the microphone to someone else.